The 15-0 regular-season campaign of the SPS volleyball team was the best in program history. SPS lost only three games the entire season, beating 12 opponents in straight sets. The team’s only loss came in the NE semifinal against Loomis Chaffee. Coach Scott Reynolds credits his team’s success to a “well-rounded skill set and the depth of our bench.” Setter Catherine Reynolds ’19 dominated NEPSAC this season. Over her four years at SPS, she set school records for service aces (190) and assists (1,200). She also was in the top five all-time for blocks (101), digs (835), and kills (293). Outside hitter Ali Kimball ’19 led the team in total kills (545) over three years at SPS and finished her career with 113 aces and 764 digs. Middle hitter Lizzy Iseyemi ’19 contributed 60 kills and 54 blocks this season. Reynolds earned First-Team All-NEPSAC honors, while Kimball and libero Mina Oates ’20 were honorable mention picks. St. Paul’s earned its first undefeated football season since 1989, finishing at 8-0, as Evergreen League champions, and capping the campaign with a 16-6 victory over Pingree in the Ken Hollingsworth Bowl. SPS was one of 58 private schools competing for an invitation to the seven NEPSAC bowl games. Division I college prospect Parker McQuarrie, a 6’ 7” quarterback, earned first team All-NE honors, along with running backs Malcom Bussey ’21 and Marshall Mather ’19 and defensive back Joey Corcoran ’20. Fullback Jon Saklad ’19 and OL Andrew Mullins-Grant ’19 were second team selections. With McQuarrie (32-60, 780 yards, 8 TD, 2 INT, 114 QB rating) at the helm, the Big Red offense averaged 34 points and 308 yards per game. The defense allowed opponents only 8.6 points per game. Bussey averaged 16 yards per carry and scored 12 touchdowns. Under the guidance of 2018 NH Prep School Coach of the Season Heather Crutchfield, the Big Red notched a third consecutive perfect campaign (7-0) against NH prep schools to win the Lakes Region title. SPS finished with an overall record of 15-2-1 and advanced to the NEPSAC Class A quarterfinals. NH Prep School Player of the Year Josie Varney ’19, a midfielder, led NH prep schools with 18 goals (seven of them game-winners) to go along with 11 assists, figuring in 41 percent of her team’s offense. The front line of Eliza Farriss ’20 (17g, 4a), Ellie Neel ’20, and Bridget Babcock ’19 combined for 26 goals and 13 assists. Amanda Sudnik ’21 added nine goals. Goalie Megan Mallgrave ’21 earned a prep school high nine shutouts. Phoebe Day ’19 and Brett Stoddard ’19 joined Varney and Babcock as All-Lakes Region picks. 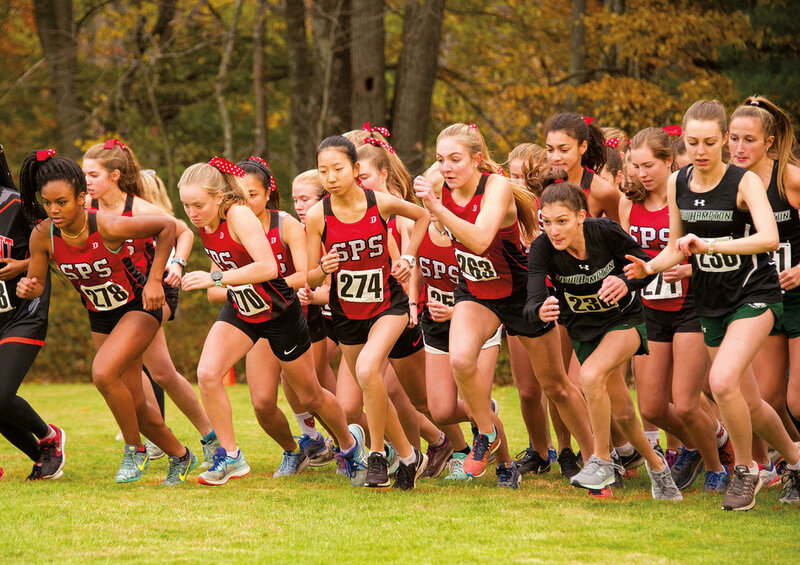 A 13-6 record and a Lakes Region title help tell the story of the 2018 SPS girls cross country team. Lauren Henderson ’19 earned All-New England honors and was a Lakes Region All-Star, along with Annie Lee ’19, Linda Pang ’21, and Amelia Walters ’21. Emily Abbruzzese ’19 received the Sportsmanship Award, Lee the Coaches Award, and Eloise Catlin ’19 was selected as the team’s Key Runner. The boys cross country team finished at 15-8, going undefeated in the Lakes Region and winning the Lakes Region Championship, hosted by SPS on Halloween. Sam Hobbs ’19, Scott Spurzem ’19, Luke Dieterle ’20, Charlie Anderson ’21, and Alex Taylor ’21 were named Lakes Region All-Stars. Taylor was selected as the team’s Most Valuable Runner, while Hobbs was recognized for Excellence in Leadership and Performance. With an overall record of 11-5-2, including 7-0 in league play, St. Paul’s won the Lakes Region title. As a team, SPS scored 34 goals and allowed only 10, recording 12 shutouts. Lydia Martin ’19 led the team with six goals, while Kristina Allard ’22 and Ella Stewart ’20 added five each. Team Offensive MVP Ginger Prevost ’20 (All-NEPSAC, NEPSWSA Jr. All-Star, Boston Globe All-Scholastic) added four tallies. Prevost joined Jax Donohue ’19 (Defensive MVP), Izzy Geneve ’19, and Abbe Riffle ’19 on the All-Lakes Region squad. The boys varsity soccer team ended its season with a record of 8-6-3. The season featured competitive games against many opponents, including Worcester Academy, Exeter, NMH, and KUA. It was highlighted by a six-game winning streak after a slow start. Captains Brenner Morton ’20 (fullback), Josh Morency ’19 (goalie), and Tade Dubilier ’19 (forward) led a young team that has great potential for the future. Dubilier earned All-NEPSAC honors and joined Morton on the Boston Globe All-Scholastic list. Dubilier and Morency were selected as NEPSSA Senior All-Stars, while Ben Jenkins ’20 was a WNEPSSA All-Star and Will Eiamsakulrat ’19 and Ronaldo Cabral ’21 were All-Lakes Region picks.